Let me start by letting you know this is a major SPOILER ALERT!! But its too late because the pics are above this text. 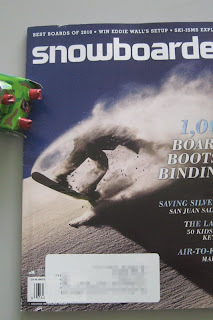 Eastern Boarder team riders teddy Lavoie and Chris Carr got full page photos in the NEW September Snowboarder Mag. Both pics were taken by east coast photog Mike Azevedo. 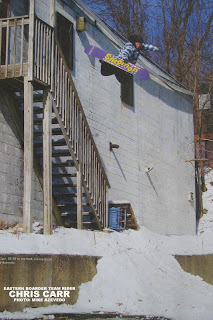 Also Chris Beresford from Fat Trax over in western massachusetts got a 2 page "On DECK" It looks like the Loon Park is producing another batch of snowboard heavy hitters. Congrats to the dudes for getting some sick shots. And making snowboarding grimey again.